Take some religious reflection. 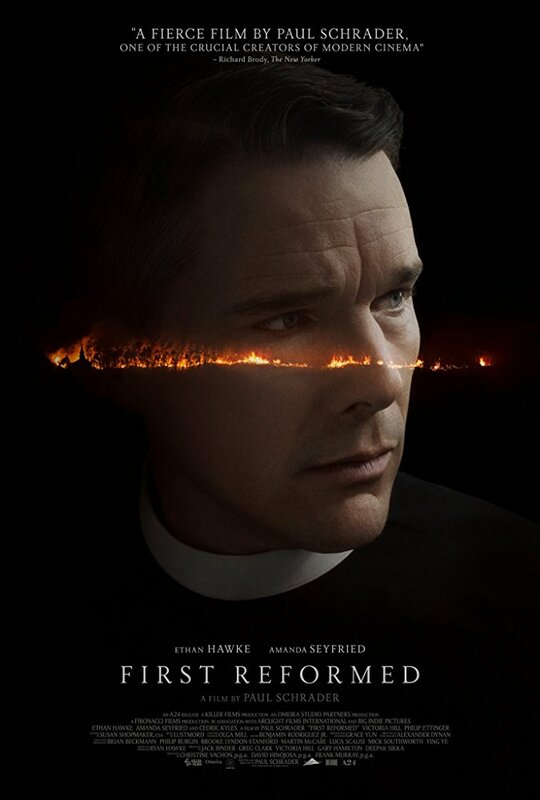 a healthy pinch of environmentalism and just a dash of Taxi Driver (which, unsurprisingly, was also written by writer/director Paul Schrader) and you have First Reformed. The film follows troubled minister Toller (a superb Ethan Hawke) deals with his own health issues and doubts, the 250th Anniversary of his historical/tourist trap church (the First Reformed - hence the title) and a pregnant parishioner (Amanda Seyfried) with an environmentally-obsessed husband (Philip Ettinger) - all leading towards a dangerous path (and ambiguous ending). It's daring, a bit trippy and certainly worth watching. 'First Reformed' is easily one of my favorite movies of 2018. Absolutely captivating from start till finish. A strong character study on faith and pain. An Excellent performances from Ethan Hawke, who's facial expressions and his tried voice says so much about the character. You're just waiting for his frustration to explode. Also, Amanda Seyfried, Cedric the Entertainer, and Philip Ettinger were all superb. No posts have been made on this movie yet. Be the first to start talking about First Reformed!